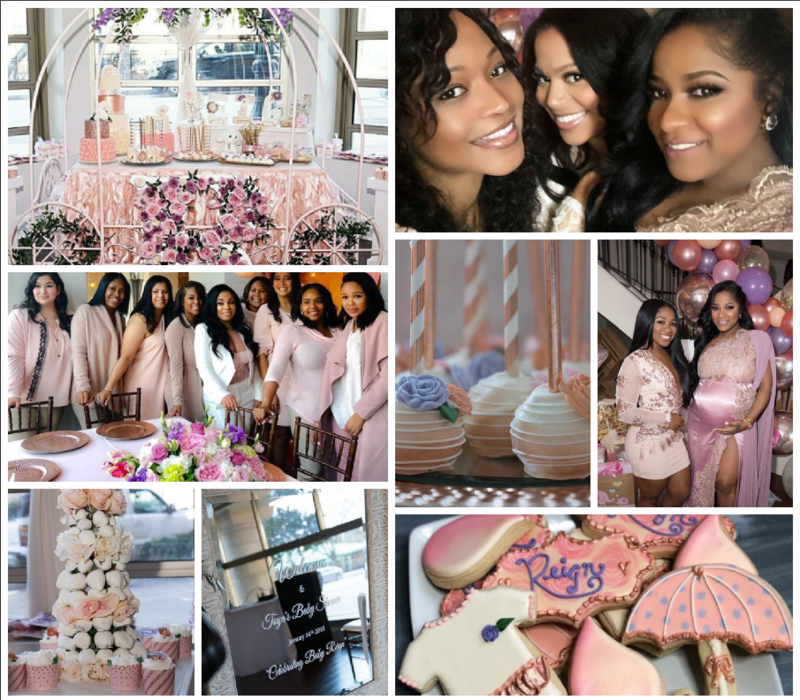 Toya Wright celebrated the impending arrival of her second child at a baby shower in an Atlanta private residence this past MLK weekend. It was a reality TV show reunion as some Our blog faves and bumpwatch alums Monica Brown, Monyetta Shaw and Rasheeda attended. Other stars of Atlanta-based shows Shamea Morton from Bravo TV‘s Real Housewives of Atlanta Quad Webb-Lunceford from that same network’s Married to Medicine. The event featured personalized candy apples, candy bar and Rice Krispie treats and more. The theme was “Showering Reign”, a take off of the name she has selected for her daughter, though in one recent post, she referred to her baby as “Reignbeaux“, phonetic spin on Rainbow with a very unique spelling. Wright also used the occasion to introduce the public to her beau and the baby’s dad Atlanta sports manager Robert “Red” Rushing. Up until this point, she had elected to conceal his identity. Secret’s out now! If the baby’s name will be Reignbeaux, this will be the second celebrity baby Rainbow in recent years because The Girls Next Door alum Holly Madison‘s first child is also named Rainbow. Reign is also a bit popular recently among celebrities. Kourtney Kardashian‘s son is named Reign and that is the middle name of Lil Kim’s daughter Royal Reign. Wright announced her pregnancy last September with a very creative scripted video featuring her daughter Reginae Carter with ex husband rapper Lil Wayne. Cake Pops #showeringReign @eyeof_aries is a fool with a camera !!! Celebrating our beautiful friend @toyawright today at her baby shower!! Everything was perfect & she’s glowing!! Almost go time!! Such a blessing!! #showeringreign #toyasbabyshower ????? Me & My Girls patiently waiting on @toyawright & our Baby Reign! #ShoweringReign ??? ?